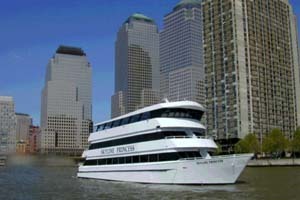 The Skyline Princess, with three spacious enclosed levels and climate controlled. The third level is enclosed with an outdoor observation deck, perfect for any photo opportunity. USCG Certified for 450 guests, but most comfortable at 300. She also offers an executive lounge and bridal changing room.